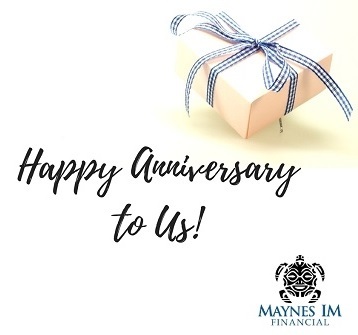 Today marks our 8 year anniversary affiliated with LPL Financial. LPL has been a terrific business partner and has never strayed from their mission to support independent financial advisors with a passion for providing quality financial advice, which we believe every client deserves. I felt that it was an ideal time to reflect on the last eight years. We are always looking to elevate the client experience and I decided to write a list of what I value, what I learned, and my conclusions. I value trust, transparency, long term relationships, and attention to detail. I learned that I've developed and refined a process that puts every piece of the financial puzzle together. I concluded that our process is best suited for professionals, business owners, and retirees, who aspire to a work-optional lifestyle. I also concluded that our name Maynes Investment Management doesn't convey the full panoramic scope of all our services. Although investment management is a focus and core competency, we often review a client's financial position, risk management, taxes, retirement plan, estate plan, family legacy, philanthropy, etc. My financial conclusion was to update our name to Maynes IM Financial. We keep our IM heritage, while being able to serve as your family's chief financial officer as life unfolds and your needs evolve. Keep in mind, there are NO changes to our email addresses, phone numbers, office location, or website. The most fulfilling part of being a financial consultant is to help people make informed decisions and feel confident with the track they are on. I value the relationships we developed, and on behalf of Kim & Jenny, thank you for being part of it! Here's to the next eight years as Maynes IM Financial. Thank you.